Wine Review: 2005 Small Gully Mr. Blacks Concoction | Wine Splash! I have always felt that a blended wine was the signature of the winemaker. He or she blended and adjusted the varieties and amounts until they felt it tasted the best for us to enjoy. Winemaker Stephen Black did a great job at putting his red wine ‘Concoction’ together which is a blend of Grenache, Shiraz, & Mourvedre. On sight, it’s a wonderful garnet color with a tinge of red brown maturity. The nose is very unique and interesting. It has distinct saddle leather, dark berry, spicebox, and tobacco aromas. But the flavor is where it is most interesting. Brambly dark fruits, blackberry, herbs, and a zesty spice on the palate. Very full bodied and a warm smoky finish that does not quit! Maybe because it is almost 16% alcohol is why it’s so warm and spicy! This wine would pair well with any food that is spicy and has a little bit of heat. Especially if those dishes have red meat or pork. So think barbeque, zesty chili, pasta with red meat tomato sauce, or spicy Mongolian Beef. So on my SiNoTas scale, I give Mr. 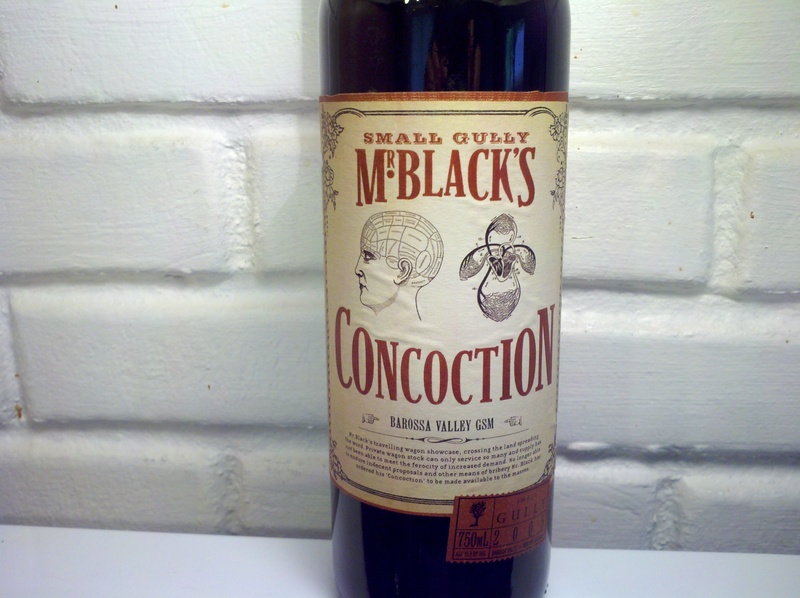 Blacks Concoction an A- rating. All the right flavors and a robust finish I love! I feel I would like it even better if there was more of a balance between the fruit, smoke, and spice. There is a bit more herb and smoke than fruit but it may be because this is a 2005 vintage and already fully matured. But it is a fun wine and worth the try! If you have a 2005 in your cellar, I would drink it in the next 12 months. Winesplashing!